Here we are in November and so Christmas is looming! We started out getting some things done at our Christmas Workshop in October. I think I can safely say that we all enjoyed the day and all were pleased with the projects they completed. I must give a special thanks to my Daughter, Rachell and my Husband Tony because they kept the food and drinks up to us while the workshop was happening. Here are the projects made and the girls hard at work or I should really say at play. This card is made using the Scentsational Season Bundle Wood $64.50(129945) Clear $58.50 (129946) and then the little gingerbread men were embossed using the Sugar and Spice embossing powder which leaves the smell of Sugar and Spice, believe it or not! Sentiment is from More Merry Messages in the annual catalogue Wood $56.95 (126400) and Clear $45.95 (126402) I just love this set! This card was CASED by one I saw by another demonstrator, but I can't remember her name, sorry. The next card is one of my own designs using the Ornaments Keepsakes Bundle Wood $87.95 (129949) Clear 77.95 (129950) which includes the stamp set and the framelits as well. This works out cheaper than buying them individually. I embossed the ornaments using Wild Wasabi Embossing Powder which gave it a nice shiny finish and really made them pop when placed on a couple of dimensionals. The white card was embossed with the new textured folder called Lacy Brocade (127819) in the Holiday Catalogue, a very pretty one, I think. The stamped sentiment is Heart of Christmas (128129) $15.95 also from the Holiday Catalogue. Then I used the stitched ribbons to hang and decorate the ornaments. The Scallop Trim Border Punch (118402) $27.95 along the sides just added a bit more dimension between the cherry cobbler card base and the whisper white. Here are some of the projects I have been working for Christmas. I must say I LOVE CHRISTMAS! it is such a wonderful time of year and although there is so much work to do, it still brings much joy. This month Stampin Up have a couple of promotions that you can have a look at. The first one is Ink-credible! Promotion Details: Hostesses who hold a minimum $650 party during the promotion period will receive a FREE collection of Classic Stampin Pads*-they can choose from Brights, Subtles, or Regals. Plus, the free ink is in addition to the regular hostess benefits-INK-credible! 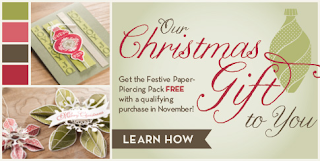 Promotion Details: It's only November, but Stampin' Claus is coming to town! Get a FREE Festive Paper-Piercing Pack when you purchase the Ornament Keepsakes Set and Candlelight Christmas Specialty Designer Series Paper Bundle. Finally, this is the lovely ornament we made in the workshop. 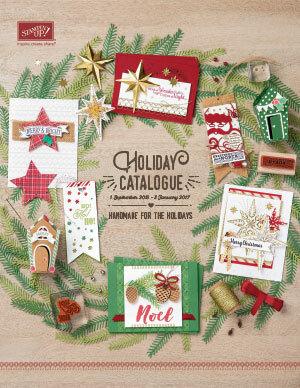 You may recognise it from the front cover of our Holiday Catalogue! It is so pretty, I am making a few of them, and so could you! They would make a lovely teacher/friend or family gift. Well, as you can see there is a lot going on at the moment so have fun working on all your Christmas cards, gifts and scrapbooking pages. Remember, you can place an order anytime, just contact me and I will get your goodies to you within the next 7 to 10 days, you don't have to hold a party to place an order! simply contact me here.